Returning to a series of beer travel-related posts I was working on a few months ago, here is a post about a visit in May to Seizoensbrouwerij Vandewalle. Seizoensbrouwerij Vandewalle was started in 2011 (first beers released in 2012) by Chris Vandewalle. Chris is the 10th generation in a line of brewers and he has a serious passion for both beer and his region. As is not uncommon for small Belgian breweries, the brewery is a second job for Chris, who works as a regional historian for his day job. Chris's passion for beer and history make him a great resource for learning about beer of the region and he is proud to bring brewing back to his community of Reninge which, although the current population is only ~1000 people, he reports was once home to half a dozen breweries. Hop fields outside of Poperinge. The brewery is located in the municipality of Lo-Reninge in the southwest corner of the West Flanders (West-Vlaanderen) province. It is not far from Poperinge, one of Belgium's hop growing centers. This region of Belgium was hit especially hard during WWI. Perhaps nearby towns such as Ypres are familiar to those who remember some WWI history. Between people fleeing the fighting to start new lives elsewhere (and not returning) and those killed during the war, this time saw the region lose nearly a generation's worth of people and knowledge. This included brewing knowledge and the types of beers being brewed. Chris is passionate about collecting what was left/lost and bringing that knowledge and history back, for general life and culture as well as beer. Even without meeting him his passion for his region and beer traditions should come through clearly based on the line of beers he makes and the regional West Vlaams product logo proudly noting the use of local ingredients. Chris's beers all have some common threads, most notably is a certain edge. To say that his beers are unpolished gives absolutely the wrong impression, but let me explain. I don't mean that his beers are rough takes that need working out yet. His beers are well crafted and are made to be exactly what they are through recipe and process. But the beers have an edge to them. On purpose. They have not been rounded out or softened for broader appeal. So that is what I mean by unpolished - they retain every bit of grit and character that Chris intends. The blond is firmly bitter - more so than I think any other Belgian beer I've had (excluding maybe Belgian made IPAs, but even then it is more bitter than most of those). The Oud Bruin is not as sweet as those familiar with the more commercial examples would expect. And the Bitter Blond à Lambiek is forward in its brett character. So I think unpolished is an accurate description in this context, but perhaps it's better to say it this way - Chris brews beers with an edge. Chris's walk in cooler with bitter blond and a selection of bottled beer. Chris is currently making 4 beers. Given his location in hop growing country, it may not be surprising that the Bitter Blond was his first beer (first released in 2012). And although I didn't ask about production breakdown, it seems to be his main beer as well. The accurately-named Bitter Blond is a firmly bitter beer with a pleasant landrace-type hop character. While the hops are grown in West Flanders, they are English varieties. It is common now to find English varieties grown in Belgium as the historic Belgian varieties had been replaced. Some small farmers are starting to grow older Belgian varieties again, but it will likely be some time before they are produced at a commercial level. While the Bitter Blond doesn't try to classify itself as such, this beer fits well with modern saisons. The first, and most obvious way, is in the pale, dry and firmly bitter characteristics of the beer along with the yeast character (though the hops play the dominant role in this beer). 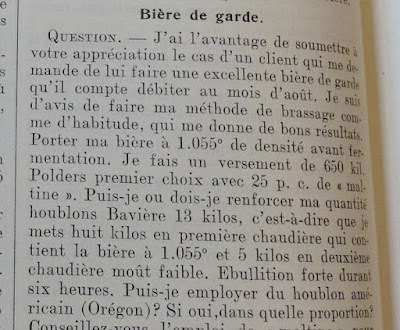 Additionally the motivation for the beer fits the lore of saison as a beer of farmworkers. Agriculture still plays a major role in the regional Lo-Reninge economy, and historically as well as in the modern day one of the major activities was growing (and then harvesting) grasses. This can be seen if you time a trip right, although now the cutting is done by industrial farm equipment. Historically this would have been by hand, and as Chris explained the field workers would have needed a refreshing bitter beer to quench their thirst. Chris has made his Bitter Blond in this spirit. Chris's second beer was his Oud Bruin (also 2012). Sour beers were once common in the region, though you wouldn't know it by looking at many of the nearby modern breweries. But in line with the modern remaining Flanders red-brown beers, the wider region was formerly known to produce darker acidic beers. Like others, Chris's Oud Bruin is a blend of an aged beer (a brown which spends about 1 year in oak) with a younger brown beer. The beer is drier than many others on the market with a great acid balance and a touch of sweeter/mellowing character from the younger beer. This is a great modern example of these mixed-fermentation brown beers which were once ubiquitous in the region, especially as sweet beer showing only hints of age and mixed fermentation can be over-represented. Kriek base in barrels awaiting the summer's cherry harvest. The third beer is Krieken Rood, a kriek made using locally grown cherries. The beer ages in oak with the whole cherries (and as Chris confirmed with a laugh, those cherries are slowly and meticulously removed from the barrel by hand). The beer is brewed in February, where it waits in oak for the cherries. In July when the cherries are in season they are added to the beer and they remain with the beer until the following February, when the beer is bottled and the cycle begins again. It was just released when I stopped by in the first week of May, meaning roughly 2-3 months of bottle conditioning. This kriek is unlike any other that I've had (note that kriek just means sour cherry and, as such, does not have any inherent tie to a given beer style). The acidity of Chris's kriek is mellow, but present, and the focus is more on a fuller/sweeter fruit (but it's not a sweet beer!) and almondy/woody character. Part of this likely comes from the varietal he is using, which his website lists as Nordkrieken from Veurne. Unfortunately I have no other experience with these cherries either on their own or in other beers, so I can't speak much to the character of these cherries. The time in oak barrels which are less neutral (more on this below) than what many other Belgian kriek producers are using and the longer contact time between the whole fruit and the beer likely play into the uniqueness of this beer as well. Here are some photos of the cherries from the 2016 harvest, coincidentally posted to the Seizoensbrouwerij Vandewalle facebook page the same day that I published this post. The fourth and newest addition to the lineup is Chris's Bitter Blond à Lambiek. The first blends were released in 2015, though bottles list blending dates as early as 2013 so this beer has been a part of the Vandewalle plan for some time. The beer is made from blending his Bitter Blond with commercial lambic (coming from Oud Beersel) at a ratio of roughly 5% lambic. The blending occurs right before bottling. After this the beer spends at least 8 months in the bottle to condition, though I've not seen/had a bottle that was less 12-18 months old. Likely due to the substantial hop presence, the beer doesn't develop a lot of additional acidity from the extended conditioning; however the Brettanomyces certainly makes its presence known. Amos at Browne & Bitter talks about this beer and the Bitter Blond a bit more in his contemporary Bière de Coupage post. Chris is brewing 450 L batches on a Braumeister system and he is employing some non-conventional process to make beer which (fittingly) breaks from the general Belgian norm. One of the most striking things about Chris's process, and something that he stresses when talking about brewing, is the time that the beers are given. For example the Bitter Blond, his beer which is released the youngest, spends 3-4 months (mostly in cold storage) between brew day and bottling. And the Bitter Blond à Lambiek spends at least 8 months bottle conditioning before release. Brewing at the scale and running the brewery that he is, Chris can fully let the beer dictate when it was ready and give it all the time it needs to get there. He firmly feels that this is best for his beer, and by tasting the products I agree with him. The cooling tun and open fermenter. Chris's beers are open cooled overnight. This open cooling is done outside in a dairy tank, which is then wheeled in to the brewing building where yeast is pitched and it ferments in the same vessel. This open cooling allows for the potential of mixed-microbe inoculation and when I taste the bitter blond I get the sense that there is something more than just sacch at play. Additionally, given Chris's focus on time, for many of his beers there is sufficient time for a mixed culture to express its different sides. The open fermentation in a relatively shallow wide pan certainly has an influence on the expression Chris gets from his yeast. Both of these processes - cooling outside in some sort of open vessel and then pitching yeast and fermenting inside in that same vessel - are accessible to home producers more easily than larger commercial producers. I may try some of this out when I'm back in the swing of brewing and the weather cools a bit. Chris is using oak barrels for the production of his Oud Bruin and Kriek, and additionally he is also aging a bit of Bitter Blond in oak for trials. It is interesting to note that all of Chris's barrels are new - their first use was his beer. He doesn't want used barrels (e.g wine barrels) as he doesn't want other microbes from whatever the barrels held previously influencing his fermentation. Now after 5 years of use he is happy with how his barrels are mellowing out and the characteristics they are giving now, though he is also expanding his barrel production and therefore not all his barrels are 5 years old yet. Visiting - Public visits to the brewery are probably best set up for small/medium groups, and include 3 beers and some local snacks. Contact the brewery to set up a visit. Otherwise look for Vandewalle beers around Belgium. They can be found at some select good beer spots (Malt Attacks in Brussels, Mi Orge Mi Houblon in Arlon, and Bierhalle Deconinck in Vichte to name a few). "A brewer does it his own way, following his belly!" If you're interested in Belgian beer travel I've written up some general thoughts as well as specific insights on visiting lambic producers and saison producers (with links for posts of my visits to individual producers within those). Interesting processes! What are the ambient temperatures of the environment when he cools over night? Does he only cool during the winter like lambic brewers do, or does he open cool year round? Good questions Dan! And sorry for my delay in answering. Chris brews year round and it is my understanding that he uses the same cooling method. I didn't see any other cooling setup and he didn't mention one so I think he is cooling outside in the summer as well. Regarding temps, the climate is generally pretty mellow. Current nighttime lows are around 16 C (60 F), which should be enough to cool that small a volume to an appropriate pitching temp overnight. Is he doing anything to prevent insects and other critters from taking a swim in the wort while it's outside cooling off? Nope, I think he's just leaving it out in the open. On a related thought, do you do anything/would you suggest it on the home scale? The other critters I wouldn't be too excited about but if it were just insects I'm not too worried personally. But I've been thinking about this as of late.